It's not quite February yet, but we've already got all the heart eyes for what is in store for next month. We have a jam-packed schedule filled with fun ahead! From birthdays to our home team playing in the Super Bowl to winter travel plans, we won't have a moment to slow down once. So in a rare moment of planning way ahead, I am already on the ball for all things Valentine's Day. A few weeks ago I sat down to order some birthday party things for Cute and B.C. While browsing online, I noticed some adorable Valentines available - particularly in the candy-free section. Due to a few allergies in The Cutes classrooms this was the route I wanted to go. I grabbed The Cutes and asked them if they liked any of the cards that they saw for their friends. I was a little nervous knowing that Elsa and Captain America currently dominate our house, but they each quickly found something they loved. 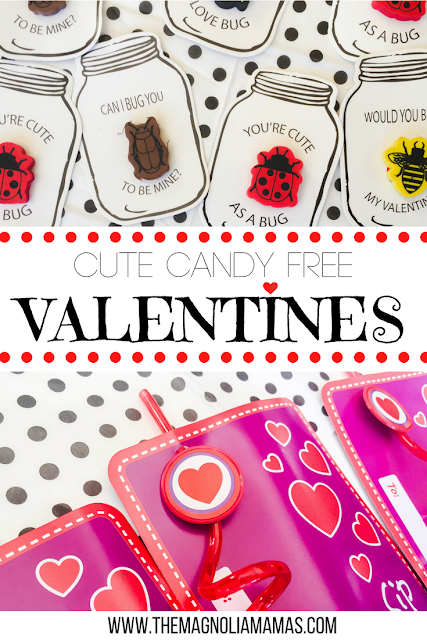 Cute immediately pointed out that he wanted these Mason Jar Bug Eraser Valentines. I couldn't believe it. They were adorable and totally not thinking what he would choose, especially when I spotted ones with ninjas, army men, and dinosaurs. There was even a nose picking sharpener option that I thought he would gravitate towards (I kid you not). But no - he was all about the bug ones. I asked why. His response was, "Because it has a spider and it's super cool. It will totally scare everyone!" Little Cute had a much more opinionated approach to her valentine selection, which consisted of continuously arguing why would people not want to have a candy treat. Finally, after much debate, we landed on something just as darling. Everything arrived quickly, and much to my excitement the valentines all arrived already pieced together! In year's past I've done everything from creating my own to purchasing the kits from the store, but this by far was the easiest option to date. No glueing, crafting, tying - or really any effort on my part at all - I'm in! The cute little sayings on each of the four options are darling and I love that we can just flip it over to personalize - so easy! They are perfect for her little age group, and I like that they can have fun with them beyond just Valentine's Day. And - just like Cute's bug ones - these came fully assembled as well. If only everything in life were so easy! I can't wait for The Cutes to share their little valentines with their classmates and friends, and I am beyond relived to have this adorable task already off my list! **These products were received as part of the Oriental Trading blogger ambassador program. All thoughts and awesome opinions are our own. These are cute, super trendy and not over the top commercial. I always refer to my grand daughters as the little ones. I think its wonderful calling your children the Cutes.